From the Museo's booklet on Three Kings' Day: Although we usually take today‘s Christmas celebration customs for granted, most of the so-called ̳traditional‘ Christmas practices we are familiar with only date back to the 19th century in the United States. It was in the 4th century that the Roman Catholic Church adopted December 25 as the Christmas holiday, choosing a date that coincided with pagan festivals of the Winter solstice. Prior to this date, January 6 was the Christian day of celebration in many parts of Europe, including Spain, Italy, Austria, Germany, and Switzerland. Even today, throughout Europe, the holiday celebration does not end until this date, marking the end of the ̳twelve days of Christmas‘ between Christmas and January 6. This is also often referred to as the Twelfth Day. In the United States, the holiday season for most ends after New Year‘s Day, however, for some Latinos the festivities continue throughout the months of January and early February. In some Latin American and Caribbean countries, Three Kings Day, or El Día de Reyes, is celebrated annually as one of the most joyous days of the holiday season. The day is also sometimes referred to as El Día de los Tres Reyes Magos or Day of the Three Wise Kings. Observed on January 6, it is recognized by Christians as the Epiphany, a feast day in the Anglican, Eastern, and Roman Catholic churches that commemorates the biblical story of the Three Kings who followed the star of Bethlehem to bring gifts for the infant Jesús. Like Christmas or Navidad, in some Spanish-speaking countries including Spain, Puerto Rico, Cuba, the Dominican Republic and Mexico among others, Three Kings Day is a religious holiday that has become a popular, cultural event. Celebrated with music, singing, family gatherings, and the sharing of food, Three Kings Day is a holiday that conveys the spirit of giving. The tradition promotes a sense of community, and emphasizes diversity, sharing, and reciprocity. The Story of the Three Kings During the 1st century, astrologers, or seers of the future, foretold the advent of a divine king who was believed to be born God incarnate. Many argued about who would be the divine king as well as when and where he would arrive. The most commonly agreed prediction was that a child would be born and that he would be named Emmanuel, meaning ̳God is with us.‘ Astrologers predicted this child would bring peace and ultimately change the course of history. It is said that the Three Kings may have practiced astrology, and thus may have each seen this prediction forecast in the stars. The Kings are also known as the Three Wise Men or the Magi. Magi is plural for magus, a word that may refer to shaman or ̳wise man‘ and is the origin of the words magic and magician. In ancient Persian cultures, the magi were responsible for funerary and religious rites. According to the Gospel of Matthew (2:1–13), the only biblical account of the event, the Magi came from ―the East‖ to first visit Herod (appointed governor of Judea by the Roman Empire) in Jerusalem, asking him where the new King could be found. Herod, troubled by the news of a new king, sent them to Bethlehem, and asked that they return when they had found him. According to legend, in order to greet the infant Jesús, the Magi traveled over a long distance guided night and day by a brilliant star that shined in the sky. The legend states that the Star of Bethlehem was located directly overhead of the location where the infant Jesús was born. When they arrived, they appeared before the baby, and offered him gifts of gold, frankincense, and myrrh. During the holiday season, many Latin Americans and Latinos erect nativities, small or sometimes life-sized figures representing the scene of the birth of Jesús, in their homes, in Churches, and in public spaces. As the legend describes, the nativity scene, known in Spanish as el nacimiento, is usually set in a humble stable, with the figures of Mary and Joseph, as well as shepherds and their animals. The figure of the baby Jesús is added on December 25, the day he was thought to be born. In parts of Los Angeles, it is common to see nacimientos in front yards. Some residents include hundreds of animals and shepherds. Special tours of these nacimientos are now offered. Near Downtown L.A., along historic Olvera Street, a colorful and music-filled reenactment of the journey of the Three Kings is performed every year. In Mexico, Mary and Joseph‘s search for shelter is re-enacted during Las Posadas, a nine- day celebration between December 16 and Christmas Eve. During these special celebrations, a family may host a party at their home to welcome the arrival of a nativity procession. The family and shepherds seeking shelter, played by children, are followed by musicians and adults who sing carols outside the home. The event concludes with the sharing of traditional foods and the breaking of a piñata. Also in Mexico, pastorelas, or shepherds plays, are staged throughout the holidays by professional and amateur groups. These traditional, often improvised, theatrical presentations date back to Mexico's Colonial period, and tell the story of the shepherds‘ and Three Kings‘ journey to find the infant Jesús in Bethlehem. In some countries, a special celebration of the nativity is held on January 5, the Eve of Three Kings Day. This day is also referred to as La Vispera de Reyes. Children dress up as characters of the nativity and perform in plays or pageants that recount the story. On this day families also add the figures of the Three Kings to the nativity scene in their home or in public spaces. In some cases, like the Three Kings, visitors to the nativity bring gifts of money or food to offer the infant Jesús. The Origin and Iconography of the Three Kings In the story described in the Bible‘s Book of Matthew, the Three Kings are said to have come from the East. If they were traveling to Bethlehem, then it can be surmised that they came from either Asia or Africa. However, again generations recount the story in a myriad of ways. Christian depictions as early as the 6th century represent the Three Kings in Persian garb. In the 13th century, Marco Polo‘s writings refer to the Kings as having hailed from Persia or present-day Iran. Parts of this story as told today are attributed to another book written in the 14th century, History of the Three Kings, by the cleric John of Hildesheim, who states that the Kings hail from "Ind, Chaldea, and Persia,‖ referring to India, Babylon (or present day Iraq), and Iran. Still other accounts tell of each King having traveled from a different part of the world, specifically Europe, Africa and Asia. It is believed that this version of the story dramatizes the arrival of various nations from different continents into the Christian faith. A similar personal twist has been added to the story in Puerto Rico and other parts of Latin America, where the origin of the Three Kings is believed to represent the three dominant ancestries of the region: indigenous, African and European. Although the Bible‘s Book of Matthew does not specify the total number of kings that came to visit Jesús, nor their names or their specific places of origin, in the West, the Three Kings are widely recognized as Melchior, Caspar, and Balthasar. As the scripture mentions three gifts were offered, perhaps it was assumed that there were three kings. Eduardo Vera Cortéz Programa de Navidad, 1978 Silkscreen, 30 3/8 x 18 7/8 in (77.2 x 47.9 cm) Published by: División de Educación de la Comunidad (DivEdCo) Collection El Museo del Barrio, NY, W91.920.2 Melchor (or Melchior) was known to have brought the gift of gold to Jesús. As one of the most precious metals, gold is a symbol of charity, suitably fit to be a gift bestowed for a king. In many accounts Melchor was an Arabic sultan or ruler. In Puerto Rico and other parts of Latin America he represents a Moor or Northern African. In this way, Melchor references the Moorish heritage of Spain since most of Spain was under Moorish rule for eight hundred years. This is still a similar representation as the Moors in Spain spoke Arabic. However in Puerto Rico he is represented with a dark brown complexion, thus representing not just Northern Africans, but the people of the whole continent of Africa. Melchor‘s feast day in the Catholic Church is January 7. Gaspar (also known as Caspar, Casper or Jasper) is usually represented as an emperor of the Orient. He is depicted as a youth of light complexion. Because of his young age he is seldom depicted with a beard. In some cases he is believed to be of Asian origin. Caspar is associated with the gift of frankincense. In Puerto Rico and other parts of Latin America, he is often represented with a bronze complexion and is believed to represent the indigenous heritage of Latin Americans. His feast day in the Catholic Church is January 6. In European accounts and in some Latin American countries, Balthasar (also known as Baltasar or Baltazar) is depicted as a Nubian prince from Ethiopia. For this reason he is represented as a man with a dark brown complexion. He is believed to have brought the gift of myrrh, a resin from trees native to Africa. As Ethiopia is regarded by some as the birthplace of Christianity, it is significant that this region of Africa is represented in the legend. However, considering that in Puerto Rico and some other Latin American countries, Melchor becomes the King to represent the continent of Africa, the significance of Balthasar changed to represent a king from the West, or rather a European king of a pale complexion. In this way, Balthasar in some parts of Latin America represents the European presence that arrived in the late 15th century. His feast day in the Catholic Church is January 8. The Gifts of the Three Kings Even though the Three Kings did not know who Jesús was, they predicted that a child who would become king was born in Bethlehem. To honor the infant, the Three Kings carried gifts fit to bestow a king. Legend states that the gifts consisted of gold, myrrh, and frankincense, brought as symbols of charity, hope and faith. Each of the Kings transported their gifts in ciboria, ornate containers or vessels. The Kings did not expect anything in return, other than the opportunity to meet this new baby king. This tradition is slightly different than what we associate with the holidays today as it does not represent a gift exchange. Additionally, the gifts offered by the Three Kings had a much more spiritual or symbolic value rather than a material value. Many Christians believe that it was Melchor who brought the gift of gold to Jesús, although in some cases this gift is associated with Caspar. Gold is a precious metal that is widely coveted around the earth by different people. It is a symbol of royalty and was offered to Jesús to mark him as an ―earthly king.‖ According to the legend surrounding the holiday, at the time Jesús was born, King Herod learned that three wise men or Magi were searching for a newborn king. Feeling threatened he demanded that the Magi inform him of the baby king‘s whereabouts. Instead the Magi secretly left Bethlehem, never informing Herod of the baby they had just met. In retaliation, Herod ordered that all baby boys born in Bethlehem be killed. Jesús‘ family was instructed to flee to Egypt where he would be safe. It is believed that the gift of gold from the Three Kings financed the family‘s long trip to Egypt from Bethlehem. The gift of myrrh is usually associated with Balthasar. Although in the Puerto Rican community he is thought to be of European descent, elsewhere he is commonly viewed as a Nubian king from Ethiopia, a place where myrrh is of high importance and readily available. Myrrh is a type of resin that comes from the sap of a tree in Africa and is collected collected for the purpose of burning incense mostly. Myrrh is believed to have medicinal and spiritual properties. It is said that Jesús was offered the gift of myrrh because if he accepted it, then it would mark him as a healer. In biblical stories, the child did accept the myrrh and his short life was characterized by miraculous acts in which he was able to heal various people. In many places in Latin America, frankincense was thought to have been brought by King Caspar. In other places, frankincense is associated with King Balthasar. Similar to myrrh, frankincense is collected from the sap of a special tree. It is mostly found in Somalia, a country in North Africa that borders Ethiopia and Kenya, and from the Middle Eastern country of Arabia. In the time of Jesús and the Magi, kings were not necessarily crowned but were instead anointed with precious perfumed oils in a special ceremony. Frankincense has the same association to royalty as it was a precious scent used by important people such as kings and priests. As such, it was used by the Magi to anoint the new baby king. It is said that the gift of frankincense was brought with the intention that if the baby Jesús accepted it, it would mark him as a god. As incense, frankincense is still burned and associated with prayer in many churches throughout the world, including the Roman Catholic Church. Another use for frankincense was found among the Egyptians who burned the charred powder into kohl, a black substance they used to create the thick eyeliner seen in so many examples of Egyptian art. Today, many people in Latin America and the Caribbean and those of Latin American descent living in the United States, continue to follow the Three Kings‘ tradition. Most notably the traditions of gift giving, singing of aguinaldos (holiday carols), parrandas (door-to-door caroling), and the sharing of food and sweets embody the kind spirit of the Three Kings. Although some of these customs may vary slightly from place to place, the message of sharing with friends and family is a common theme that is celebrated in similar rich and festive ways. Mirroring the gifts offered by the Three Kings, many people in Puerto Rico, Mexico, and other Latin American and Caribbean countries exchange gifts or regalos on January 6. Although today many people have adopted the U.S. custom of exchanging gifts on Christmas Day, most still reserve a few gifts to open twelve days later on Three Kings‘ Day. Young children wait for this day with great anticipation, eagerly waiting to receive special gifts from ̳the kings‘ or their parents, families, and friends. In Puerto Rico, the spirit of benevolence is returned to the Kings as exemplified by the gifts offered by young children and their parents on the Eve of Three Kings Day. Given the island‘s tropical climate, the Puerto Rican tradition recognizes that the Kings rode horses instead of camels on their journey. In light of this, on the Eve of Three Kings Day, or La Vispera de Reyes, children gather grass, hay, and water and place it in shoeboxes under their beds to feed the Kings‘ horses. Some children also set out their shoes next to the boxes under the bed. Their parents often set out pastries or sweets for the Three Kings. On Three Kings Day morning, children discover the pastries and food left for the Kings and animals are gone. Instead, the food is replaced with gifts, candy, or nuts that the Kings have left for them. Similarly, in Mexico, children write letters to the Three Kings requesting special gifts analogous to the tradition of writing a letter to Santa Claus. On the Eve of Three Kings Day, children leave their shoes near their bed or window, often filling them with hay for the camels and horses. The next morning, when the children wake up, the hay is gone and the shoes are filled with gifts... For over 30 years, El Museo del Barrio has presented the Three Kings Day Parade on January 6, as well as other educational and public programming with the purpose of keeping the Three Kings traditions alive. Each year, El Museo‘s dynamic parade, led by the giant Three Kings puppets, winds through the streets of El Barrio and includes lively music, colorful costumes, animals, floats, and thousands of students and community members as participants. The parade route ends with a gift distribution for the children who have marched in the parade sponsored by generous donors. Leading up to the event, El Museo, along with a steering committee of community leaders nominates ―Three Kings‖ to preside over the Parade. Being chosen as a King is recognition for outstanding cultural or political achievements within the Latino communities of New York. These honorary Kings, along with selected madrinos and padrinos, (godmothers and godfathers) lead the parade through the streets of East Harlem, dressed in elaborate costumes that are cared for by the Museum. Over the years, El Museo has presented exhibitions in our galleries that feature artworks from the Museum‘s Permanent Collection associated with this holiday such santos de palo, hand-carved wooden statues created by master artisans as posters, posters from the División de Educación de la Comunidad (DIVEDCO) that celebrate the tradition of El Día de los Reyes, and the giant Three Kings puppets. During these three decades, El Museo has distinguished itself as the leading institution in New York City that celebrates and promotes the Three Kings Day tradition. El Museo‘s Three Kings Day Puppets Our gigantic puppets are central to El Museo‘s annual Three Kings Parade. In 1978 when we created the parade, museum staff and artists contributed to producing its props and decorations. Our original puppets reflected the Three Kings Day legend and were used in over thirty performances in the cold winter weather. Popular Christian culture depicts the Three Kings arriving to Jerusalem to celebrate the birth of baby Jesus. According to legend, each king brought an offering that came from his respective homeland. King Gaspar brought incense from Asia; King Melchior brought gold from the Middle East; and King Balthazar brought myrrh from Africa. In our 33rd Annual Three Kings Day Parade, we welcomed our new generation of puppets created by El Museo‘s artist educator Polina Porras. 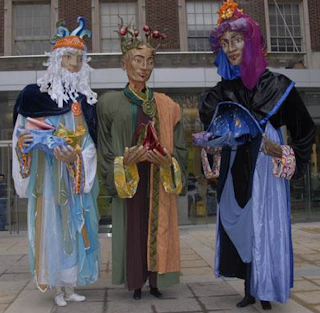 This year, we are exhibiting these giant puppets, which will be part of our annual parade on January 6, 2011. These beautiful 12 feet tall creations are made of paper maché, color fabrics, and a carefully crafted structure that allows for graceful movement. To the traditional representation, the artist has added a new source and inspiration based on Taíno cosmological traditions. Melchior, who represents the night sky, has black and dark blue clothes and carries a present that symbolizes the celestial dome shaped in the form of a bat—which in Taíno tradition signifies the connection with the ancestors. Gaspar, who represents the connection between the celestial and the under worlds—which in Taíno tradition are connected by the Ceiba tree—wears green and brown clothes and carries as a present the base of a Ceiba tree trunk. Balthazar, who represents the underworld, wears light blue and turquoise clothes and carries as a present a seashell with a turtle coming out of it, which represents the birth of Taíno culture. The synergy of the Christian and Taíno traditions wonderfully embodied by our new puppets, perfectly synthesize the unique cultural mix that characterizes our community as well as El Museo del Barrio‘s mission.